May 12, 2014 Woodbridge VA. Looking to see what was covered in our Striking Kickboxing classes? Sifu Leonard Stevens stops to review the class for students who took it, and for those who might have missed it. Check out our page about Pat Tray’s JTX, unique blend of Jeet Kune Do and Muay Thai, providing the power and tenacity of Thai Boxing with the science, concepts and adaptability of Bruce Lee’s Jun Fan Gung Fu techniques. You’ll see techniques from other arts in this class, such as the French foot fighting art of Savate, in addition to Western Boxing and particular delivery of the instructor. 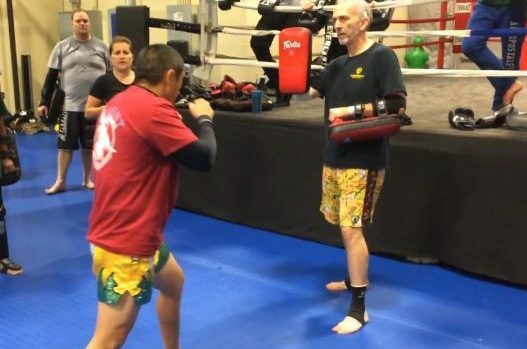 Sifu Leonard introduces and develops how to pin your opponent up against the wall (cage or corner applicable) and score winning knockouts against the whizzer! Sifu Leonard shows the Zig Zag three step Progressive Indirect Attack, into the traditional body hook or a series of street type groin strikes or slaps. Great tactics for Street or adaptable for MMA Fighting. Video #2 Added, scroll down to the bottom, will use this same page for now and just add 'em on to end. 5/19/14: Major points not on the vid: 1. One of the main goals of this class was to help you understand that not every punch or kick has to have "heat" on it. Some can be utilized just to throw your opponent off his game/timing a bit. To create openings both physically and mentally. 2. As I'm throwing the hooking "dead hand" the vid cuts off just as I'm making this very point. 3. Positioning at this range becomes very subtle and a bit hard to see. Note where I'm standing at the end of my three hands-off line. This placement not only puts you slightly out of his "sweet spots". It also allows you to take advantage of any opening in your opponents guard (to enter to the plumb or whatever). 4. When you have your opponent in plumb (Thai clinch). Use your body inertia to move him, experiment with the two holds I showed, and keep his head turned and his face "smushed" into your sternum. 5. The three hands should be thrown at different speeds (and eventually at different levels). Breaking time will create openings. 6. Hit in-hit out, be first, be last, be always! Hope this helps. And as always your opponent has a vote. So remember if you're not moving or attacking you're a target. Leonard's JTX Recap Video #3 is up on the web, this is from last night's class. He showed how to counter the kick, pin and jam up your opponent against the cage (wall, corner, etc.) and then counter off the wizard. 6/9/14. Major points not on the vid: I developed this series of drills to help you with your inside "game". 1. Even though you're in tight, and playing the "grind" game. Remember positioning and attack concepts are still paramount. Cutting angles, fakes, head movement etc. Should still be used. 2. Pressure hard, then when you feel him open. Out to heavy hands with supplemental trapping. 3. The spinning back elbow, fist, kick. Are all "blind". Learn to feel where your opponent is. Don't give away the surprise by letting him see you looking. Also, he may be trying to get to your back when he breaks. So looking may give him that split second he needs to take your back…. Most guys "break" sloppy. So I've found these shots to be there the huge majority of the time. 4. In the second series. After the bicep stop don't reload for the hook. Come right off of the bicep, turn your hip and throw the punch, slap, or elbow. 5. Your exit to hands has to be fast. And when you reattach, you should think that your body is punching him. Slam as violently as you can back into him. I've found especially when your opponent is bigger/stronger. Violent in and out pressure works best. IE keep him stressed and guessing. 6. Don't "load up" your punches (or any strikes for that matter)….Just a reminder: Try to get you some MMA style gloves. The next few weeks I'm gonna get into trapping. Hope this helps………. Be first, be last, be always. NO ego…Cardio, cardio, cardio and more cardio. And always remember your opponent has a vote. So remember if you're not moving or attacking you're a target.